Welcome to our two lovely holiday sites situated in the heart of the beautiful countryside of Central Brittany. 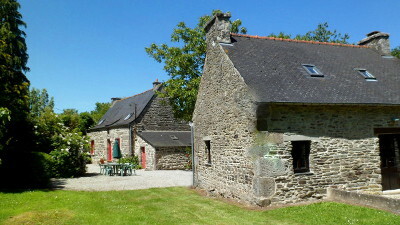 We offer a selection of self catering cottages / gites suitable for all ages and group sizes. Both of our sites are only 15 minutes from lake Guerlédan (the largest man made lake in Europe at 400 hectares) which offers boating, many watersports, fishing and beaches. In peak season there are boat trips and a floating restaurant. It is also only 30/40 minutes to the coast, but if you find all that too energetic. 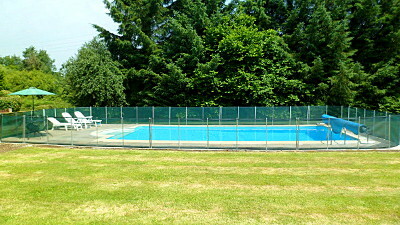 Each site has a heated (electric), fenced swimming pool, simply relax and enjoy! Kermarch is the larger site with three properties and can sleep 5-28 +cots and Lustruyen sleeps 4-16 + cots in two properties. The sites are about 10km apart. 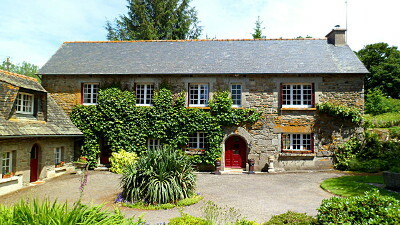 Situated just a 5 minute drive from Saint Nicolas du Pelem, 15 minutes from Lac Guerlédan, the largest lake in Brittany offering many watersports, restaurants and beaches and only 35 minutes from the coast you will find our lovely 17/18th Century hamlet of Kermarch set in 4 acres of trees, fields and gardens. On site you will enjoy swimming in our professionally installed 12 x 6 metre heated ( electric), fenced swimming pool with a shallow end and roman steps. The pool is heated to 27 degrees and is normally open from the end of May to the end of September. The pool is sheltered and well positioned to be in full sun all day with tables, chairs, parasols and sun loungers to relax on. Also in the grounds are a boules court, table tennis, large trampoline with safety net, children's swing and slide, baseball net, Little Tikes log cabin, badminton net,table football and new for 2018 a wooden fort /climbing frame. We also have a large field that is kept cut for ball games (football, cricket and rounders) so that the young ones can play within sight but without disturbing the adults. There is plenty of room within the grounds to park cars safely. Kermarch is in the countryside but yet only 5 minutes away from Saint Nicolas du Pelem which offers a large supermarket with fresh fish counter, butchery, bakers and all necessary provisions. There are 4 bars, a pizzeria and 2 restaurants in the town, a couple of banks, doctors, pharmacy and garage. The nearest large town is 30 minutes away, Saint Brieuc which is the capital of the area and has a huge variety of shops and a hypermarket (Carrefours) Pontivy is only a 30 minute drive and has lots of different small shops, a weekly market and a Chateau open to the public. The 18th century granite farmhouse and adjacent cottage are let as one unit and are ideal for larger family groups. They are set away from the other two cottages down a private drive in their own pretty formal gardens with lawns, shrubs and plenty of mature trees for shade. The house has been renovated to offer comfortable accommodation but retaining its olde worlde character. Located on the Kermarch site but away from the farmhouse and cottage are Maisons Madeleine and Marie. These two semi detached cottages next to each other were recently converted from an old seventeenth century house and stable and offer very bright, comfortable accommodation. Both properties share access to the swimming pool with the farmhouse and cottage. 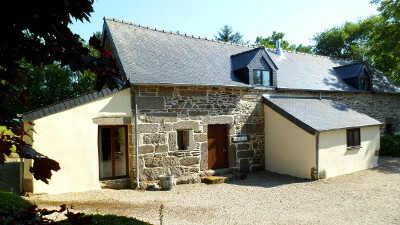 Madeleine is the larger of these two properties and sleeps max 6 adults - 4 children and cot. 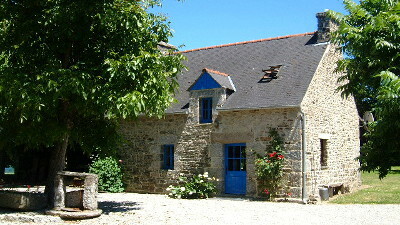 Located on the Kermarch site but away from the farmhouse and cottage are Maisons Madeleine and Marie. These two semi detached cottages next to each other were recently converted from an old seventeenth century house and stable and offer very bright, comfortable accommodation. Both properties share access to the swimming pool with the farmhouse and cottage. 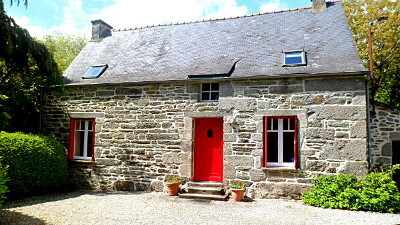 Maison Marie is the smaller of these two cottages and sleeps 2/4 adults - 1 child and cot. Lustruyen is set in two acres in a very quiet rural area but within five minutes of the market town of Rostrenen offering all facilities (3 supermarkets, Doctors, garage, tennis courts, bank and restaurants etc) and a weekly small general market on Tuesday mornings. The largest lake in Brittany, Lac Guerledan and the Nantes/Brest canal are only 15 minutes away and offer many water sports including canoeing, kayaking, wakeboarding, wind surfing and water skiing as well as small sandy beaches, restaurants and boat trips along the lake in July and August. The North and South coasts are about 50 minutes away. There are tennis courts in Rostrenen and fishing in the small rivers and lakes nearby. The roads and lanes around this area are quiet and flat and ideal for bike riding (bikes can be hired locally) with lots of designated randonees (footpaths) criss crossing the countryside. The two properties on this site, the cottage (sleeps 4/6) and the farmhouse (sleeps 10) can be rented separately or are ideal for larger family groups (max 16) who would prefer to rent both and have the pool/place to themselves. 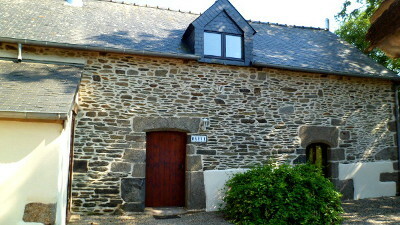 Pretty detached slate and granite cottage that sleeps 4/6. The ground floor has a lounge/kitchen/diner and bathroom. The kitchen is well equipped with a gas hob, electric oven, fridge and microwave oven. There are plenty of china, cutlery and glasses and all the normal appliances ie kettle, toaster, coffee maker, hand blender etc. Situated across the gravelled courtyard from the cottage is the farmhouse that sleeps 10 + cot . There is an open plan lounge/kitchen/diner with large farmhouse table comfortable sofas and chairs, log burner, books, flat creened TV with freeview channels, video and DVD player. The kitchen is very well equipped with plenty of quality glasses, crockery, cutlery, non stick pans as well as a kettle, toaster, coffee maker ,hand blender etc. There is a gas hob/oven, fridge, microwave oven and dishwasher. The two properties on this site, the cottage (sleeps 4/6) and the farmhouse (sleeps10) can be rented together and are ideal for larger family groups (max 15) who would prefer to rent both and have the pool/place to themselves. Please note: Both Lustruyen Farmhouse and Cottage have a key to the outhouse where the washing machine, freezer, iron, ironing board etc are located.